Moccasins were worn as shoes. Plains Indians made all of their own clothes. Most all of their clothes were made from animal skins. Antelope and deer were the most often used. The women were responsible for making clothes for their entire tribe. Men typically wore animal skin leggings, a loin cloth, and a belt. They rarely wore shirts, instead they wrapped buffalo furs over their shoulders. These were known as buffalo robes. A distinguish man, who was known for his bravery, often wore a grizzly bear claw necklace. 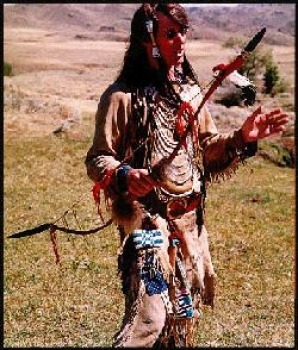 A man who was considered to be a distinguished warrior often wore an eagle feather warbonnet. The number of feathers on the warbonnet related to the number of brave acts performed by each man. 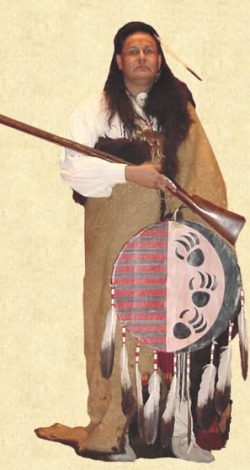 Women and girls of the tribes wore dresses made of deerskins. Women often wore jewelry, such as earrings and bracelets, made of sea shells, metal, or beads. Young boys in the tribe often wore leggings and loin cloths like the tribal men. All Plains Indians wore moccasins on their feet. Women were in charge of making the moccasins for their tribe. Moccasins were usually made with animal hides and buckskin. They were decorated with beads and quill work. Ceremonial clothing was usually everyday clothes that were painted and decorated for each particular celebration or ceremony.